Objective: We examined the accuracy of type 2 diabetes (T2D) patients' risk estimates of developing coronary heart disease (CHD)/having a stroke as a consequence of diabetes and their mood about these risks. Methods: Patients reported their perceived risks of developing CHD/having a stroke and rated their mood about these risks using a self-report measure. Using an objective risk calculator, they were then told their actual risk of CHD and stroke and their mood was re-assessed. Results: Patients' estimates of their risk of CHD/stroke were grossly inflated. A negative relationship between disease risk and mood was also seen where higher risk of actual and perceived CHD/stroke was related to worse mood. A positive relationship between mood and extent of perceptual error was further observed; the more inaccurate patients' perceptions of CHD/stroke risk were, the better their mood. Mood improved after patients were given accurate risk information. 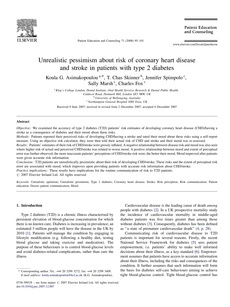 Conclusion: T2D patients are unrealistically pessimistic about their risk of developing CHD/stroke. These risks and the extent of perceptual risk error are associated with mood, which improves upon providing patients with accurate risk information about CHD/stroke. Practice implications: These results have implications for the routine communication of risk to T2D patients. © 2007 Elsevier Ireland Ltd. All rights reserved.